iSpring is an e-Learning development tool that enables educators to take e-Learning to a completely new level. With this comprehensive software, course authors can build presentations with audio narrations, create vignettes, embed interactive images, seamlessly integrate screencasts, and even create quizzes. While the program’s functionality is impressive on its own, the optional integrated learning management system elevates iSpring capabilities to a class above other similar tools. iSpring seamlessly integrates into PowerPoint and enables tutors to enhance both in-person and online learning experiences. iSpring is such a complete and user-friendly tool that even those who never envisioned tapping into e-Learning can quickly embrace it. After just a one-hour training session, elementary school teachers were able to enhance existing presentations: they included interactive elements to increase student engagement and quizzes to monitor student understanding. We appreciate just how adaptable iSpring is to a variety of learning environments. At the elementary school level, teachers traditionally focus on hands-on and experiential learning opportunities. iSpring opens up wonderful new possibilities for educators! Now we have transformed traditional reading aloud into interactive presentations, and video demonstrations into powerful example-rich media courses. With iSpring, even a basic teacher-created PowerPoint presentation can quickly become an interactive and engaging learning experience. We have created a collaborative team of people who have already discovered the power of iSpring. We decided on what courses should be enhanced or recreated from scratch with the help of iSpring. While working on this, we got an opportunity to focus on what each of us liked most. This way, we have managed to create a renewed course archive, to which every student has access. The e-Learning capabilities of iSpring LMS are exceptionally helpful in allowing learners to take lessons at their own pace. iSpring, with its loads of functionality, enables all educators to put a new spin on learning. Additionally, with the program’s user-friendly interface, even novices can quickly get creative. 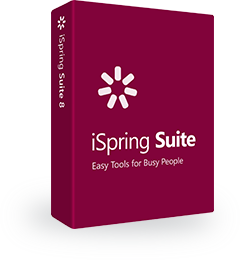 Check it out for yourself by visiting the iSpring demo page and prepare to be impressed!